The apartment was design as a pied-a-terre for a craft collector and as a permanent home for her collection. The design team responded to the unit's limited footprint and exhaustive space requirements by leaving the apartment's floor plan open and airy. 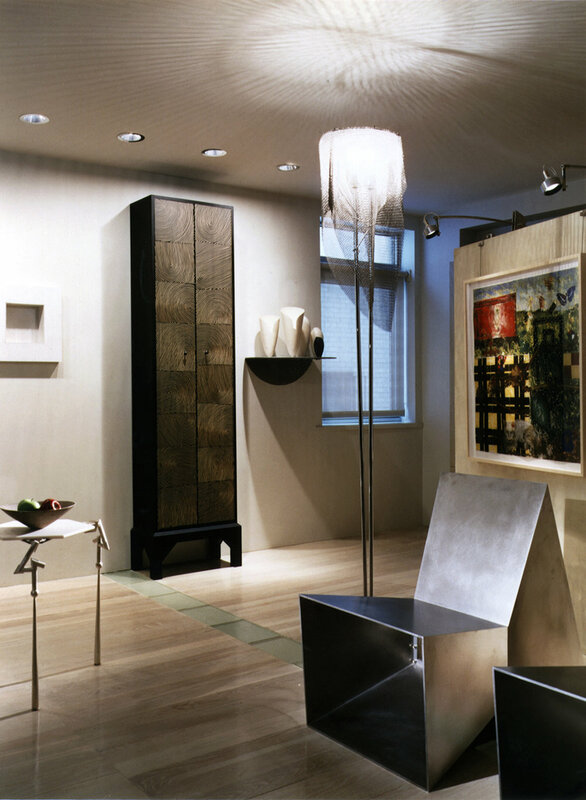 Storage and display units, rather than complete walls, define individual areas. The bedroom, for example, is divided from the living room by a meticulously crafted wardrobe block with pocket doors that open to reveal a fold-out desk. A cast glass inset in the floor traces the line where the main wall once ran. The glass inset is also a horizontal plumb line that emphasizes one of the design's chief gestures: a curved partial wall that screens the kitchen from the living room. Its low height makes the standard 8-foot ceiling appear to float high above. The palette of materials is texturally varied, yet neutral in color, taking second position to the collection.